"You will find something more in woods than in books. Trees and stones will teach you that which you can never learn from masters." Saint Bernard . 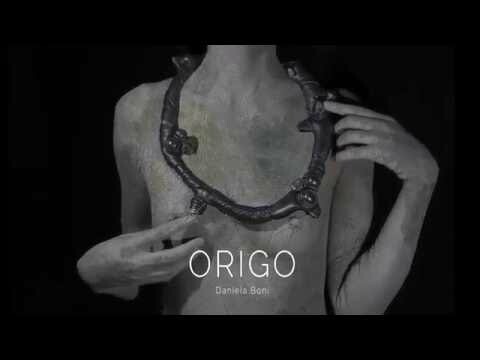 Creativity Oggetti presents Origo’s exclusive preview, Daniela Boni’s sculptural jewelry collection. On the 9th of February only the gallery Creativity Oggetti will transform into a bush: from the shadow, as glittering dew drops, the crystals and stones of Daniela Boni’s jewels will come alive. A genuine passion for Nature and jewelry pushed Daniela Boni to experiment creating objects featuring a rude, wild and rebellious soul. Her first collection is named ORIGO: as the Original Start of Life, the Life sparkle, the Beginning of the Universe, the Source. Through an incessant search and a fascination about the substance and its free variables Daniela Boni instils , using her hands, lots of imagery shapes: In this representation leather turns into the trees’s cortex, the gems into buds , sprouts and shoots, tangled roots,to adorn, praising powerful Mother Earth, glorifying the opposite principles of beauty and hardness. Every jewel is an exclusive tale of a complex and articulated world, it’s hand-crafted and is a unique and unrepeatable object gifted with strength and energy. The exceptional pleasing to the touch of this sculptural adornments, connected to a desire to reproduce authentic natural surfaces, has been framed in the wonderful photographic narration by Marcello Bonfanti, winner of many rewards, last but not least Sony’s World Photography 2016 Portrait Award, whose photographic technique comes from a deep study of Art History: the Renaissance paintings composition manner and the Barocco's lightings, quite detach the figure from the context, ennobling while underlining singularity. On the opening night of the exhibition a “thematic” light buffet will be offered. Creativity Oggetti , located at the ground floor of the noble Palazzo Lanza building, is focusing, since 15 years, on artists and designers dedicating themselves to research hand craft excellence and to define a personal artistic character. Study and research in applied Arts are the salient points of the selection and during these years of collaboration with so many Artists and Designers a vaste production of thematic exhibition has been shown and this allowed to create new unique Operas and intere Collections as well. Born in Buenos Aires, lives and work in London and Turin . Working as an advertisement stage designer allowed her experiment with different materials to create ephemeral space and furnishings, an expertise later applied permanent space like private apartments and public place. A slow and progressive work through which Daniela Boni developed her personal style of ambient design-elegant, essential,minimal and at the same time open to suggestion and contaminations from art and music. Her in depth knowledge of the materials renders her an insirend and inspiring design’artisan’. In 2002 she organized her first solo exibition in the ‘Adelinquere’Gallery. In 2005 took a part in the ‘Alta Gradazione’ exhibition at the Palace of the Counts Botton di Castellamonte with the piece ‘Planetarium con il Razzo‘(Planetarium with rocket) wich subsequently was acquired by MIAAO (Internationa Museum for Craft Arts Today)in San Filippo Neri Turin where it is permanently exhibited. In 2007 she is the curator of the exhibition ‘Super Craft Super Gift’ at MIAAO museum in Turin, next she is the curator of the exhibition of contemporary jewellery ‘Eclectica’ at CATARTICA art gallery.